San Diego Police sketch of the East Village sexual assault suspect. Authorities asked the public Tuesday for help in identifying an unkempt man who jumped a woman on an East Village roadside, dragged her into some shrubbery and sexually assaulted her. The 26-year old victim was walking by herself in the 400 block of 13th Street about 11:30 p.m. Monday when the attacker grabbed her from behind and pulled her off the sidewalk, according to San Diego Police. Following the assault, the man ran off to the west on Island Avenue, Lt. Jason Weeden said. 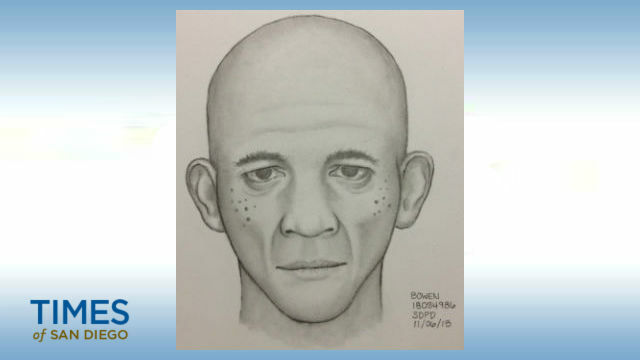 The woman described him as a thin, bald, 40- to 50-year-old black man with pungent body odor. He was wearing a white T-shirt and carrying a green blanket, and appeared to be homeless, she told police. “Detectives are currently searching for additional witnesses and evidence,” the lieutenant said Tuesday. Anyone who might be able to help investigators identify the assailant is asked to call San Diego County Crime Stoppers at (888) 580-8477. Tipsters may remain anonymous and could be eligible for a reward of up to $1,000.